“Oyez Oyez jeunes gens !” This is a critical day, our planet is ailing because of us. It is time to change our working habits! As florists and human beings, we depend on the well-being of nature. 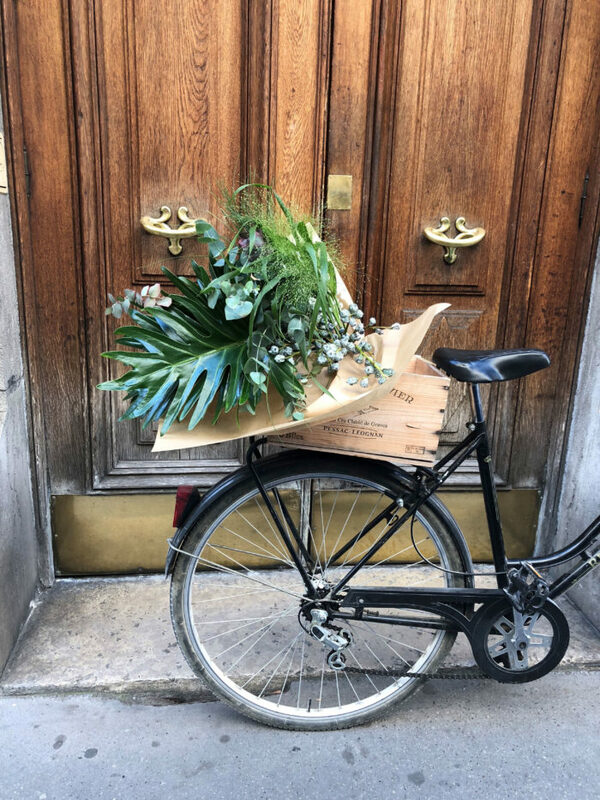 We are aware that florists can be confronted with several difficulties due to the location of the shop, especially in Paris, and because of our customers’ shopping habits. Luckily though, solutions do exist for us florists to become more environmentally responsible, just by carrying out some small well-intended practices. Here are some thoughts we’d like to share with you. -With the wrapping for example, by using paper instead of plastic and natural fiber as ties. -We could stop giving out paper bags and instead sell reusable fabric bags, showing the shop’s logo? -How about composting our own rubbish? That way we could make our own compost for plants and for customers. – Why don’t we form partnerships with local producers for our cut flowers and plants? – It could also be wise to use bikes and electric cars for deliveries. Created in May 2018, this start-up offers lovely edible bouquets of fresh flowers and fresh foliage for you to admire, purchase and before long consume! Amandine and Blanche, the two entrepreneurs of this start-up, wanted to make edible flowers, which have mainly been used in gastronomic restaurants for a while now, more accessible for all to enjoy. All of their flowers are carefully grown and picked by small-scale French producers. The idea was to promote the local economy with untreated, organic, French flowers. From April to November, the flowers are grown in the Ile-de-France, and during winter, they mostly come from the Var. Every week, customers can buy a different bouquet in different sizes (medium or prestige) and receive information about every flower and foliage that the bouquet is composed of. On every fact sheet, there will be the name of the flower or foliage, a drawing that shows the edible parts, and to top it off, a recipe that suggests how it can be consumed. Growing Concerns is the exhibition that made me discover Almudena Romero’s work. Her work focuses on the subject of migration. Images are printed directly onto plants from Asia and the Caribbean Islands thanks to the organic process of chlorophyll printing. Almudena’s Growing Concerns has already been exhibited in London and Europe. I was lucky enough to see it in the Le Centquatre exhibition, in Paris, last year, and you shouldn’t miss it if you’re interested in the relationship between floral and the visual arts. The exhibition is a series of chlorophyll prints that focuses on the reduction of restrictions and regulations for goods and money. These images use commonly available plants from Asia, the Caribbean and Latin America, and make use of images that correspond to the regions from which each plant originates. The chlorophyll process is a fascinating way to capture images. It is based on sun bleaching and the use of a positive to create photographic representations directly onto leaves. Watch the video below for a step by step guide of the process. Almudena Romero is a London based contemporary visual artist. She works with a variety of photographic processes to address themes of identity. This year, on the morning of Valentine’s Day, a client entered our flower shop with a particular request. The young women explained to us that she lived in London and that she had prepared a surprise for her boyfriend, who lived in Berlin. After three months of separation, the young couple had decided to meet up for Valentine’s Day in Paris, the city of lights and love. The young woman, Mrs. L, had organised a paper chase for her sweetheart and our shop was the second to the last step on the list. Mrs. L, who was really excited about her idea, explained that she had left some cards for her boyfriend on which there were instructions and riddles for him to figure out the different steps of the game created just for him to have an unforgettable day. Mrs. L left us a picture of the two of them for us to recognize him when he came to the shop to buy flowers by 4pm. She also left us the last, but not the least, clue of the paper chase: a little Eiffel tower key ring which gave us an idea about the big finalé of their day. We got really into the running of the game, which had been a real breath of fresh air in our very busy day, but we began to but worry as he didn’t arrive at the scheduled time. Finally, tired and sweaty, the sweetheart showed up at our shop 3 hours later. He ordered some flowers and showed us all of his cards. He explained that he had a long day and couldn’t wait to discover the final surprise and finally unwind. We gave him the last piece of the puzzle and he left for the Eiffel Tower with the flowers, macarons, and a bottle of wine in his hands. So, if you want to have a perfect and very special Valentine’s Day, take the lead, create a paper chase for your loved one, and make especially sure it includes stopping at a flower shop to pick up a beautiful floral composition that transmits all the love you have for each other. Plein air Paris was created by Masami Charlotte Lavault in 2017, after having won the the bid for the “Parisculteurs 1” project called by the City of Paris. Plein Air is the first flower farm structure in Paris intra-muros, a parcel of 1200m², located next to the Belleville Reservoir, just behind the Belleville Cemetery, in the 20th district of Paris. As for her credentials, Masami Charlotte studied industrial design in Vienna & London, and then she turned to agriculture and what she calls “agridesign”. After that, she took up biodynamic gardening in Morocco and Great Britain, then it was off to Japan to learn about the use of efficient microorganisms, and finally she delved into organic floriculture with the American horticulturist Erin Benzakein of “Floret Flowers”. Eventually, she returned to France to carry out this Paris floriculture project in collaboration with Pépins Production. Her approach to growing flowers is to do it without pesticides, insecticides or chemical fertilizers, and her cultivation method combines biodynamics and the use of efficient micro-organisms for a fully environmentally friendly soil. These microorganisms are bacteria used as probiotics for soil and plants. She wanted to include unique varieties,chosen for their beauty, their fragrance, their lifespan and their compatibility with the Parisian climate, season after season. This selection is of great diversity, with dozens of flowers and foliage blooming simultaneously. Visitors can purchase dahlias, rudbeckias, purple basilic, carrot flowers, foxgloves, zinnias, and giant amaranthuses, among others. Harvesting takes place in respect to each species, thus encouraging maximum longevity and abundance for each bloom. Cultivation of the land began in the fall of 2017. Now, she sells her production to both individuals and businesses. There are even a few florists in Paris who source their flowers from her. You can buy flowers by the bunch, by stems, or in bouquets. Sales can be done directly or by visiting the farm from spring to the end of fall every Saturday afternoon without an appointment. Enter through the Belleville Cemetery. Take the main alley at the bottom, take a right and go to the green gate! You have arrived! In flower shops, seeing more women working in the business is indeed a fact. But then at Rungis, France’s international flower market, you’ll see that it’s men who are selling the goods and women who are buying them. That’s no surprise as when it comes to recognition, it is the men who have the honors. For example, at the last floral art competition in France, no woman was in the running compared to the previous challenge where there was at least one. “Participating in competitions requires a certain spirit of competitiveness and above all, a lot of availability. For floral art, it takes two years of preparation with tests taking place in the evening and on the weekends.”, says Charline Pritscallof, MOF 2011 (Title of the Best Craftsman in France). For the most part, women would choose their family life and satisfying themselves only through exercising their jobs over preparing for competitions. But for Charline, it was different, as it was through 3 men that her passion for floral art and the desire for competition germinated. Moreover, she has no family constraints. “I have always dreamed of this distinction to overtake and vibrate.”, says Charline. The competitions for the MOF title were divided into three subjects: making a chair for a virtual character, creating a suspended garden of 2.5 meters high and finally imagining an element that could be worn for a gay marriage. “The rather manly boys were not very inspired by the subject as they were afraid of falling into the stereotype or taking a wrong-step,” explains Charline. For the MOF winner, it was a shoulder decoration designed from a green orchid and violets that gave her the title. Received by the President of France as the best craftsman in France (MOF) 2011, she received the honor at the Elysée Palace. “It’s a tradition that marks a life,” she says, with her eyes full of stars. Her goal has been reached: gaining access to the supreme recognition, and above all, keeping the masculine gender of the MOF title. Here is our yearly share of some florists’ tales that made the cut on Valentine’s Day 2019. A man came into the shop to buy flowers for his valentine and he asked for the cheapest flower I had in the shop. When I showed him the beautiful rose we sold for 6 euros, he said it was too expensive. So I showed him a very little red rose we sold for 3 euros and this time he said it was ok. When he gave me the money, he winked at me and left me 1 euro in a vase that wasn’t even made for tips. Two men working in the same street as I do came to our shop on Valentine’s Day, but each time alone to order a bouquet for the other without knowing that that was the case. They both requested that a card be inserted into their bouquets, proposing a date to the other on the same night at a restaurant. They hadn’t known each other well as they had met only the day before, but it turned out to be love at first sight that brought about the same idea and the same tenderness. The day before Valentine’s Day, a woman came to the shop and was looking at the bouquets and floral compositions that we had made. She was looking for what her husband could offer her. She came several times on the same day, looking for new compositions. For Valentine’s Day, her husband bought a beautiful orchid composition. The next day, she came back to thank us and said she was extremely happy with the arrangement. Hope everyone who celebrated Valentine’s Day did it in style with flowers saying it all …..